Rooftop dining in Istanbul is one of the fanciest experiences that you can get in the gorgeous Turkish city. 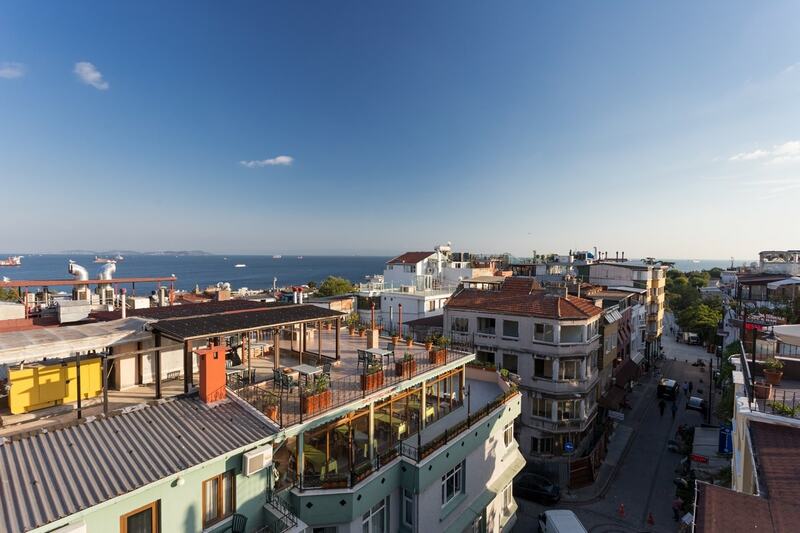 Rooftop bars and restaurants in Istanbul provide stunning views of the city from above, with its mosques and minarets and the blue of the Bosphorus. 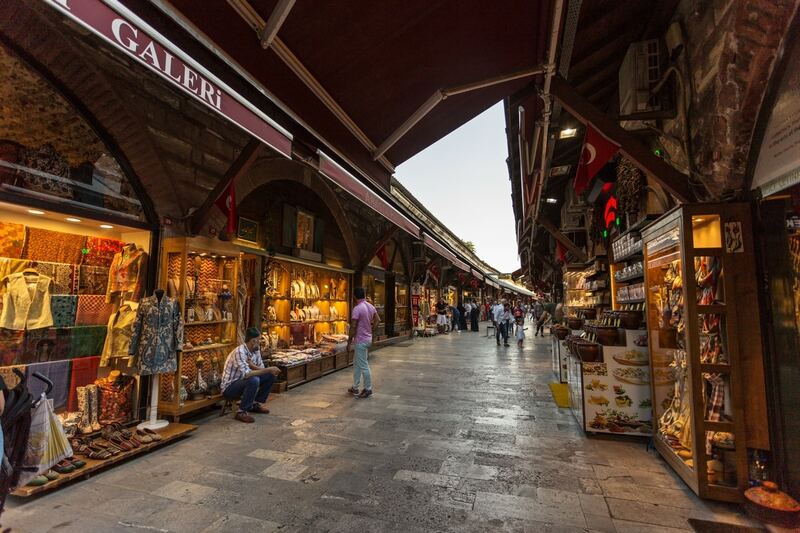 Istanbul is a vibrant city that has a lot to offer, but what to choose when you only have a few hours to spend in Istanbul on a layover? 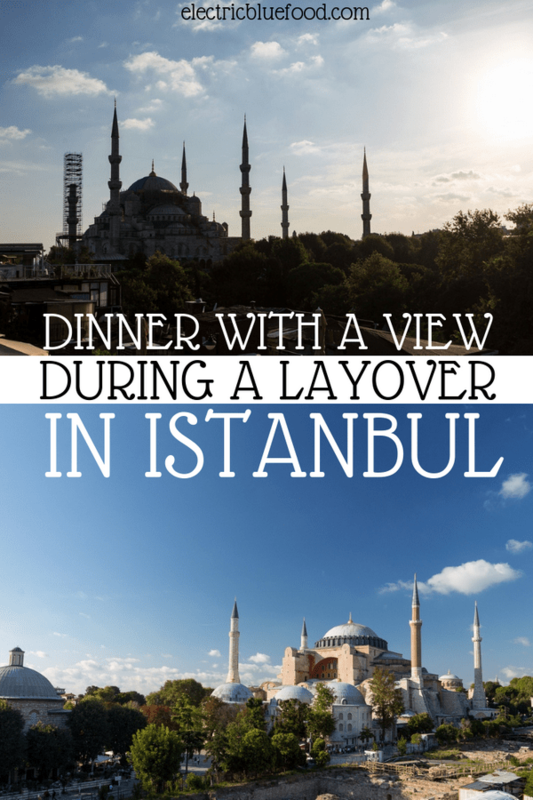 We came in the late afternoon and we had no hesitation: if we were to only have one eperience that was going to be dinner with a view in Istanbul at a rooftop restaurant. 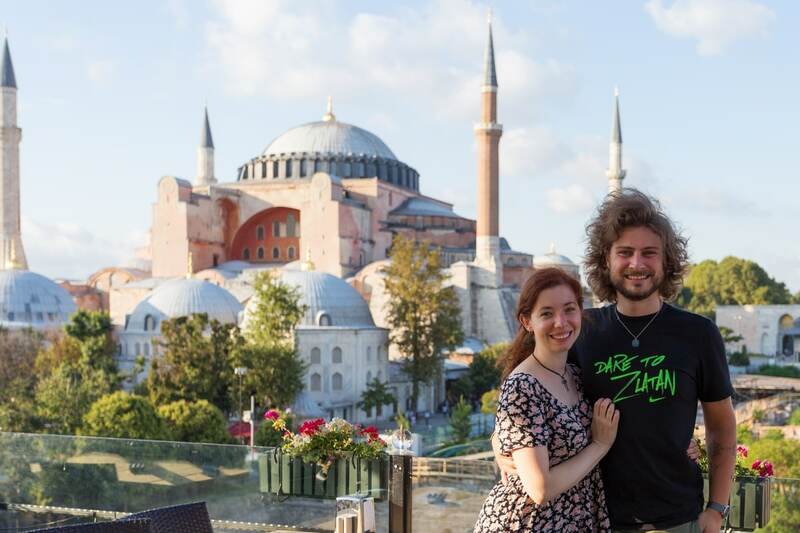 When we left for our honeymoon we happened to have a 9-hour layover in Istanbul. We were flying From Stockholm to Bangkok with Turkish Airlines and the cheapest way there included a 9-hour layover in Istanbul. I had read that Istanbul is easy and convenient to reach from the airport and that when you have this much time you are actually able to fit in a short visit of the city. 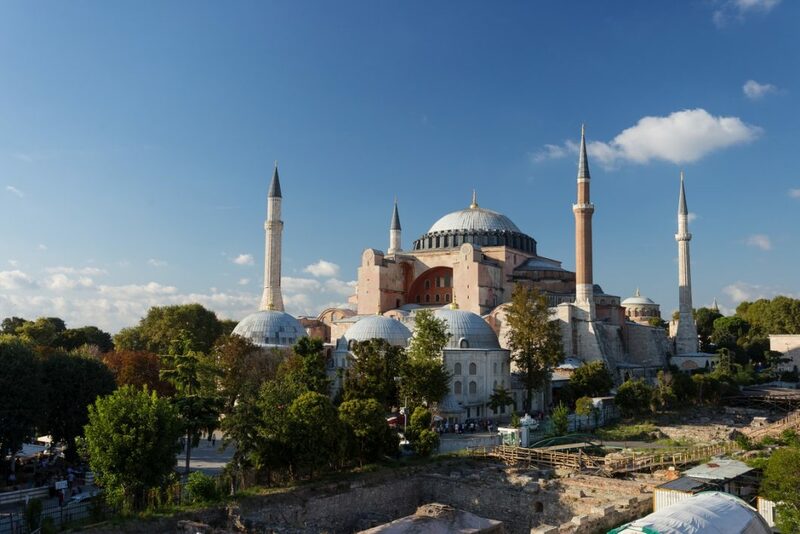 Turkish Airlines offers free guided tours of Istanbul to passengers who have a 9+ hour layover. It’s called TourIstanbul and it’s a group tour offered by Turkish Airlines. Tours are offered at various times of the day, so all you need to do is to show up at a designated place inside the airport and show that you are a Turkish Airlines passenger on a layover. 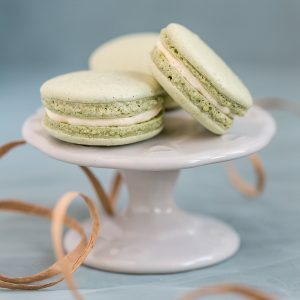 There are several tours offered throughout the day, and they generally include food, too. Unfortunately, despite having 9 hours to spend in Istanbul, we were not able to join a TourIstanbul tour as we landed exactly when the last one for the day started. So if you wish to take advantage of this service, make sure to check tour times and plan your Istanbul layover around this timeframe. I had also considered getting a private guide to help us navigate the city as much as possible in the limited time we had. Unfortunately most attractions, including the Hagia Sophia and Grand Bazaar, would be closed by the time we’d arrive. We figured that paying a guide only to walk around and see attractions from the outside was not worth the price. Landing in Istanbul in the late afternoon really looked like a bad time. I was determined to get a glimpse of Istanbul during the layover and not be stuck at the airport so I started looking for inspiration. That’s how I came across rooftop terrace dining in Istanbul. Getting to Istanbul from Ataturk airport is very easy. All you need to do is take the red line M1 of the metro to Zeytinburnu, and there you transfer to tram T1 to Kabatas and get off at Sultanahmet. 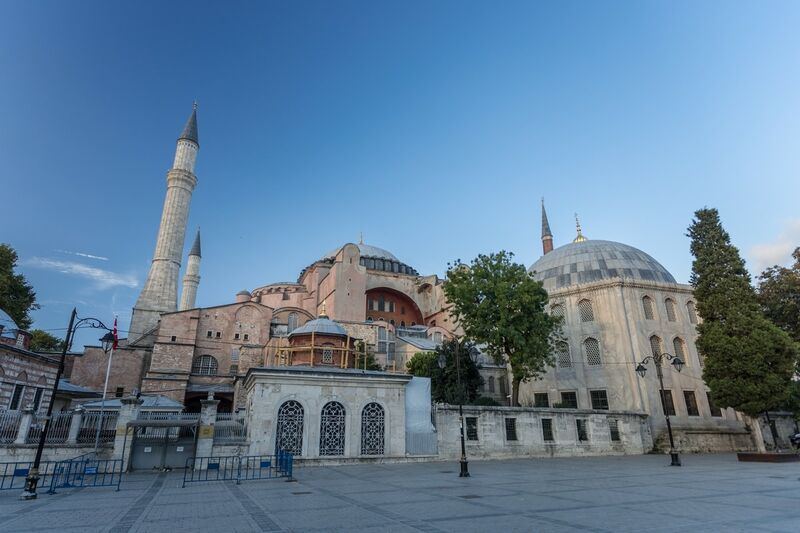 That is where both the Blue Mosque and the Hagia Sophia are located, the very heart of the old town. Each ride is charged separately, so we needed to purchase a total of 4 rides per person in order to travel there and back. We purchased a 5-ride card at the kiosk at the airport metro station and jumped on the first train into town. By the time we got through immigration and into town I figured it would be time to have dinner, so that became my plan for my few hours in Istanbul. Once I decided that what we were going to do in Istanbul was eat, I started doing some research. 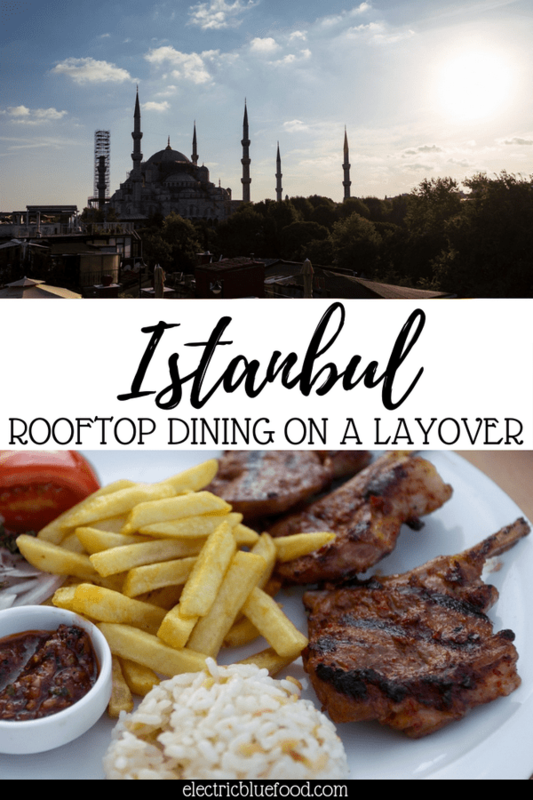 I looked for the best restaurants in Istanbul with a view and came to learn that there are quite a few restaurants with a rooftop terrace. 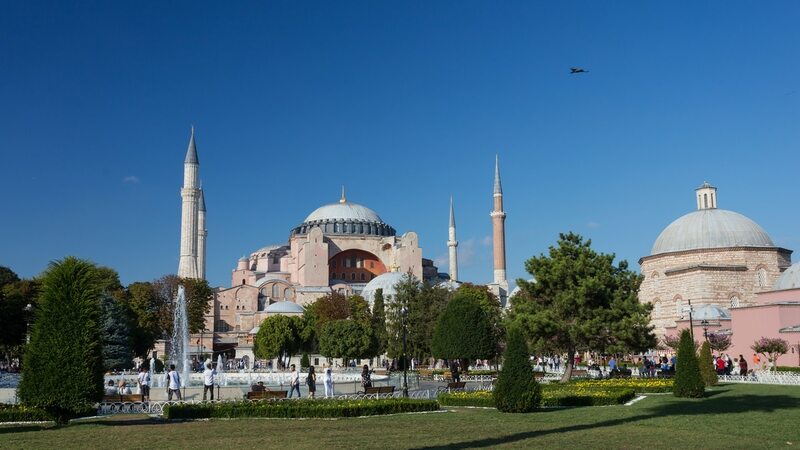 The Sultanahmet area provides excellent bird’s eye views over the two most famous mosques in Istanbul, The Hagia Sophia and the Blue Mosque, as well as over the Bosphorus, the Strait of Istanbul. I attentively studied the map of Istanbul and ultimately made my choice and reserved us a table at Seven Hills restaurant. 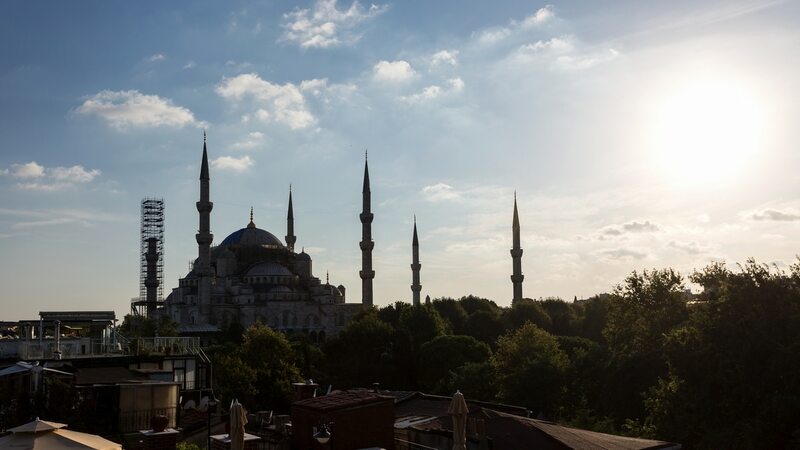 Perfectly located right between the Hagia Sophia and the Blue Mosque, a stone’s throw from the sea, Seven Hills restaurant is nestled on the rooftop terrace of the Seven Hills hotel. The views that you get to see while eating on its rooftop terrace are absolutely stunning. This restaurant is particularly famous during the sunset. When I contacted them to reserve my table they got back to me to let me know at what time the sun was setting that week, asking if I wanted to change my reservation time to enjoy the sunset. I was actually pretty happy to score a seat during the golden hour so I declined the offer, but I thought it was cool of them to ask. The Hagia Sophia seen from Seven Hills restaurant in Istanbul. 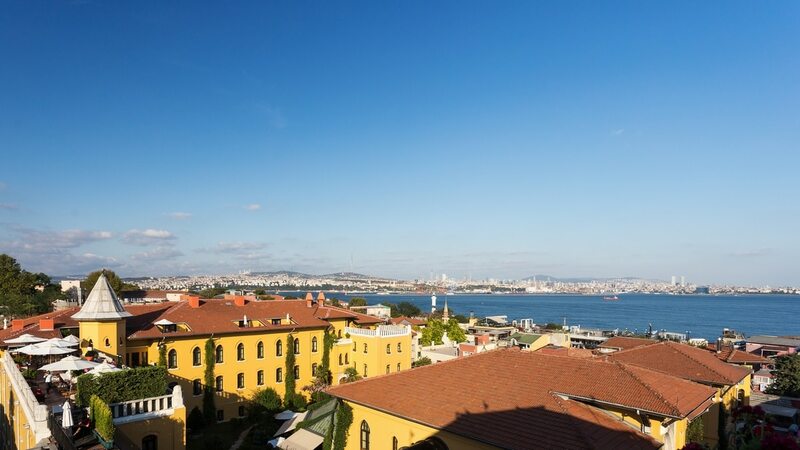 A view on another panoramic terrace and the sea of Marmara right behind. The sun was setting behind the Blue Mosque while we were at Seven Hills restaurant, and graced us with this beautiful silhouette. 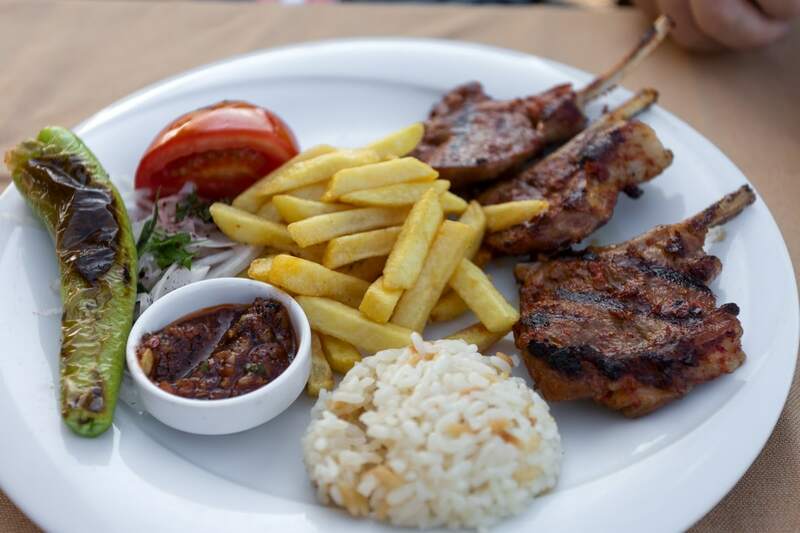 How is the food at Seven Hills restaurant Istanbul? We were pretty pleased with our meal at Seven Hills restaurant. I had read online reviews stating that the food is overpriced. I did not have very high expectations, as we chose this restaurant mostly for the view. We were totally prepared to pay a little more for the experience of eating with a view on the Hagia Sophia. Although I cannot compare as I haven’t been to any other restaurant in Istanbul, the prices did feel a bit high. Thus said, we actually really liked the food, and the experience as a whole was worth the extra money. 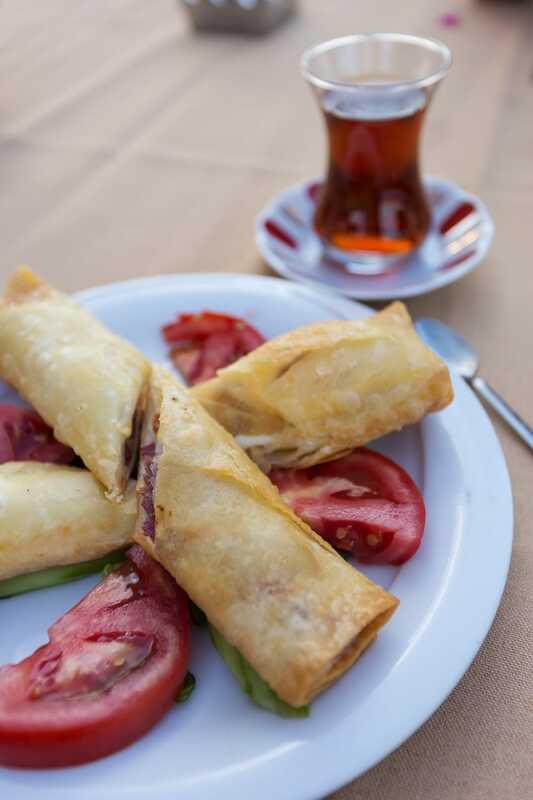 We shared two appetizers and one main dish, plus my husband took an Efes beer and I ordered a tea. We had a portion of hummus and a hot savoury pastry filled with Turkish bacon and cheese. As main course we ordered the lamb chops. The meat dish came much smaller than the one you see on the picture on the menu, that was the only disappointment. Seven Hills restaurant markets itself as a seafood restaurant and at first we had only been given the fish and seafood menu. 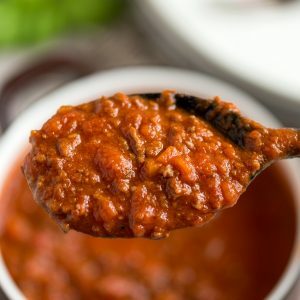 I had seen on the website that they also make meat – we had already set our minds on the lamb, in fact – so I had to call the waiter to ask specifically for the meat menu. The hot appetizer: savoury pastry filled with meat and cheese. The lamb chops, served with rice, potatoes, grilled green pepper and a hot dip. The lamb chops were very good, and so was the hummus. It was so good I dove in and did not photograph it. I think that the overall quality of the food was good and it did not make Seven Hills restaurant feel like a tourist trap. The bird’s eye view of Istanbul is clearly its strong point and the waiters let their guests roam around the terrace to photograph the beautiful landscape all around. For once I did not feel too awkward photographing my food as literally everyone had their cameras out at all times! Many online reviewers recommend visiting Seven Hills’ rooftop terrace only for drinks. You end up spending less and you get the same view. I think that the food is worth trying, but I’m always the kind of person that will take one beer less and invest on more food, so maybe I’m weird. Sitting down for an actual meal felt more relaxed, as we didn’t want to feel the pressure of ordering more drinks or having to leave. We were only in Istanbul for a few hours and we would have needed to eat something anyway. Seven Hills restaurant might be expensive, but so is the food at the airport anyway. Waiters at Seven Hills restaurant are quite used to getting asked to be the photographer. We had an overall positive experience at Seven Hills restaurant in Istanbul and brought back the beautiful pictures we captured of Istanbul from the vantage point that the terrace was. 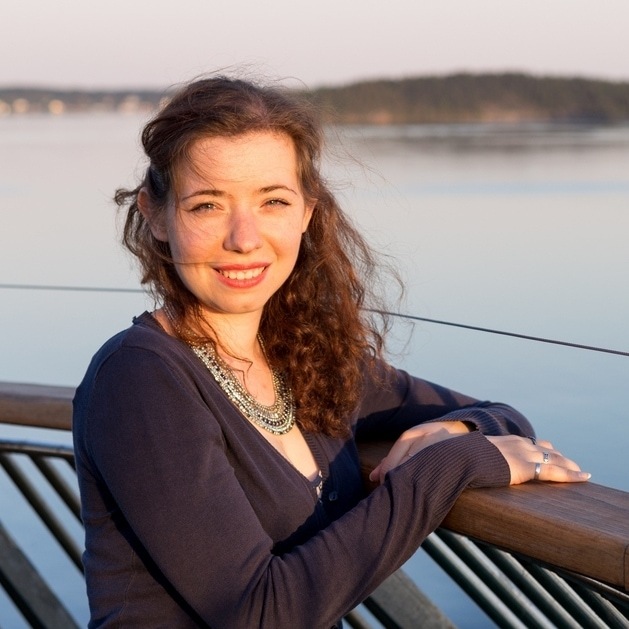 If you are in Istanbul for just a bunch of hours, especially in the late afternoon or around the sunset, I’d recommend spending one hour at Seven Hills restaurant. In our case, it was too late to get to visit anything so we were pretty content with a good view of Istanbul and a meal in a nice place. We had not planned to see much more of Istanbul than what we got to see while dining at Sultanahmet. 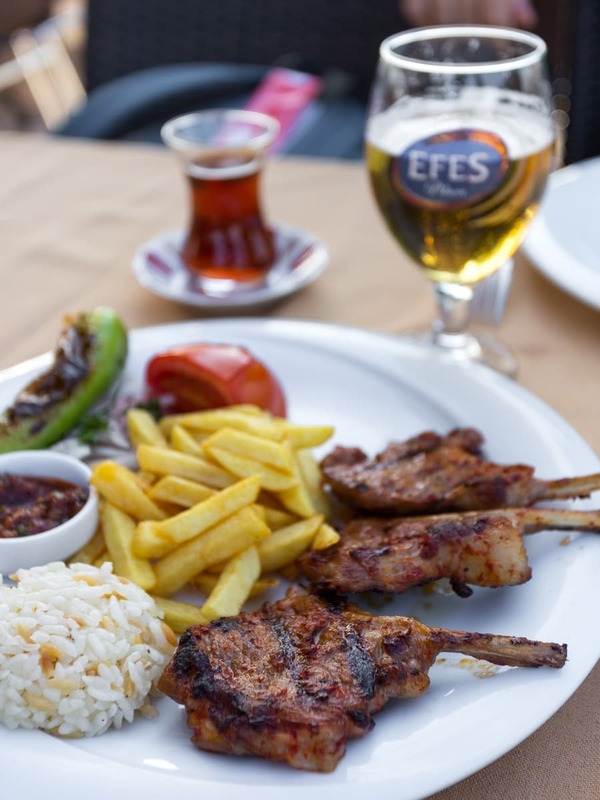 If you have more time – spending a few days in Istanbul, or just a longer layover – then maybe you could find a different restaurant. Then you also have the time to properly visit the mosques and maybe even get to cross the Bosphorus by ferry. 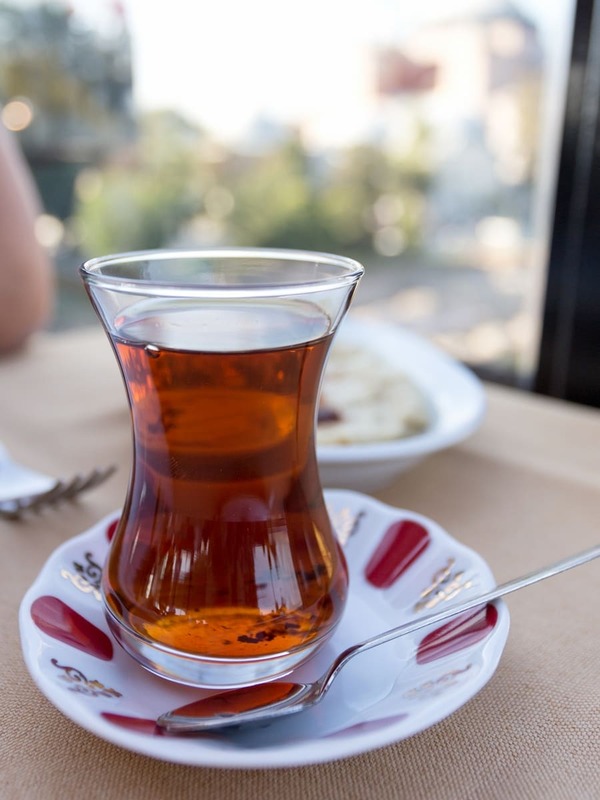 But if you’re short on time and you’re just in for a quick glimpse of Istanbul rather than spending many hours at the airport, visiting Seven Hills restaurant at Sultanahmet is a great idea. It’s the perfect way to put together a good meal with great photo opportunities of some of Istanbul’s most remarkable landmarks. The Hagia Sophia from street level. If you’re in Istanbul on a layover it’s likely that you don’t want to miss your next flight. Still, you don’t need to spend all your layover inside the airport, as the city is well connected to the airport and getting to Istanbul by public transport is cheap and easy. Thus said, there are two factors that are worth keeping in mind when planning to exit Ataturk Airport to explore Istanbul on a layover. Lines at immigration are long. All the time. Ataturk Airport is a huge hub and the amount of passengers transiting through it daily is massive. Expect to stand in line at immigration for up to one hour both exiting and entering the airport. If you plan on going out of the airport, make sure to comply to any visa requirements, depending on your passport. We could visit Istanbul visa-free, but still spent around 45 minutes in line. Traffic in Istanbul is real. Istanbul is a huge city that can experience serious traffic jams. The metro connects the city with the airport, but if you’re headed to the old town you will have to transfer to a tram. By the time we got through immigration and travelled the first part of the journey into town by metro peak rush hour came. We had reserved our table at 18:00 and at 17:20 we were stuck in a traffic jam in the tram. We eventually made it, but the ride took longer than I expected. So if you’re booking a table somewhere, take this into consideration. Despite having 9 hours during our layover we really did not want to risk anything and made it back to the airport well in time in order not to miss our connecting flight to Bangkok. Overall, we spent about three hours in Istanbul. We landed at 16:00 at Ataturk Airport and reached Sultanahmet square around 17:40. We dined at Seven Hills restaurant between 18:00 and 19:00, then took a walk around the area to see both mosques from street level. We accidentally passed by Arasta Bazaar, which was unplanned but great so we also bought some souvenirs. Around 20:00 we took the tram back to the airport. Our flight was after 01:00 in the night, but by 20:00 it had gotten dark and we felt like there was nothing more we could have possibly seen. We did end up spending a few hours at the airport anyway, but the short visit of Istanbul made the long layover go by faster. We just got a glimpse of a city that has so much to offer, so now we really want to go back. With Istanbul as final destination of our trip, this time. Still, dining on a rooftop restaurant in Istanbul was a great way to kickstart our honeymoon and a great way to spend a layover. Check out where we stayed and what we did during our honeymoon in Cambodia. Wow this looks great for a stopover! I had no idea about this but will defo look into it for further trips! Great way to break up a journey. If you have enough time to include a long layover I’d always recommend it. Sure it takes longer to get from start to destination, but you get to explore some more! Too bad the timing of your flights didn’t allow you to do the tours, but you made the best of things. I love rooftop dining and the food you had looks amazing. Pinning for next time I am in Istanbul. You always need a reason to return, right? Definitely trying to get better layover times next time, in order to take advantage of the free tours! 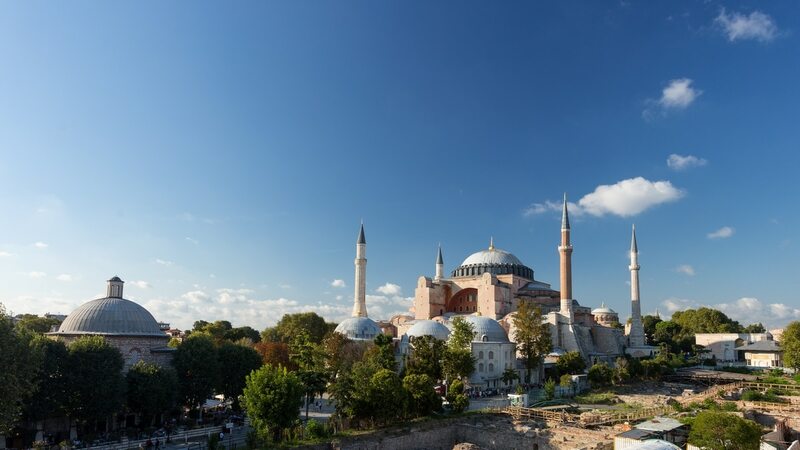 The view of Hagia Sophia from the Seven Hills restaurant is incredible. I love to have a meal at this place anytime. It was a wise decision to return back to the airport considering the traffic in Istanbul. I must say that you made the best use of your layover. Thank you! I’m glad it all turned out perfectly timed, as the traffic had made me worry a couple of times. But luckily I had a great time and the view was fantastic and worth the trip out of the airport! The view is breathtaking, wow! Definitely a great view to enjoy your meal with! Istanbul architecture and culture seems very interesting, I’d love to visit it in the future. It was a very nice experience, even if it was just for a short time. I would like to see more of Turkey now and have more of that food!! Istanbul definitely needs more than one day! That city’s huge and the traffic is unbelievable, it’s definitely better not to rush it and allow time to explore. What a nice post! I hate layover so things like thus on how to spend time in places like Istanbul really helps and that dining place looks really nice! I am a sucker for spending time in airports, but this time I was pretty excited to get out and explore. That view was all worth it! Those views! It’s really cool that Turkish Airlines offers this service– I don’t think I’ve ever heard of a better way to spend a layover. Several airlines have such services, what’s awesome about Turkish is that it’s free of charge! Still, even when paying I think it’s an awesome opportunity to get a glimpse of the layover country. I’ve never done a layover trip, but what a good idea! The Arasta Bazaar looks incredible – right up my alley! Looks like a beautiful mini-trip. It was indeed a mini-trip, or a smaller-sized adventure. Totally recommended as an alternative to spending many hours in an airport!